Wow what a couple of days. This weekend was full on, for many reasons. There was lots of meals, socialising, cooking and most of all – gardening. While I was in Bali it was like the weeds had thrown a big party. I got home to find more weeds than plants! I really don’t know how it took me so long to notice, but I decided this weekend I would get rid of them all. I got rid of half before my bin got full. So next weekend will be ripping out weeds part two. Before I start telling you about this recipe I want to share a little story. I popped into my local supermarket Saturday afternoon to get a few things for this recipe plus a cake I cooked (will share this cake next week!). I asked a store-worker if they had any unsalted butter, seeing there was none on the shelf. He disappeared so I thought I’ll get the cream while I wait. Sitting high up on the shelf (and me being very short) I reached up to grab the item. Just as I do so, a little old lady reaches through me and knocks over another container of cream. From the corner of my eye I see it fall. Smack on the shelf below. Then I feel a cold liquid run down my leg. I cringe, then slowly look down. The whole container has spilt on my shorts, and is now running down my leg and into my shoe. Gross. I can smell only cream. I froze, still reaching up with my cream in my hand. The worker comes back out and stops “awwww…. [pause] we have no unsalted butter”. So about this tart. PS I hate cream right about now. In a pan over a medium heat, add the butter, a good slug of olive oil and leeks. Stir the leeks so they begin to caramelised. After 5 minutes add the water and continue stirring. When the leeks are golden and cooked through, remove from the heat. Set aside. Lightly spray two 12 x 35 cm tart tins with a removable base with cooking oil. Place the sheets of puff pastry over the centre, making sure the corners and side are completely covered. Use small overlapping pieces of puff pastry to cover any free areas. Press the edges down with your fingers or the back of a teaspoon, then score the base of the pastry with a fork to allow air to come through while baking. Place a sheet of baking paper over the pastry and top with baking weights (or something like rice) and blind bake in the oven for 15 minutes. After 15 minutes, remove the tin from the oven and discard the paper and weights. Place the tin back in the oven and cook for a further 5 minutes. In a bowl, add the eggs, cream, parmesan and salt and mix well. Place an even layer of the caramelised leek on the base of the tart. 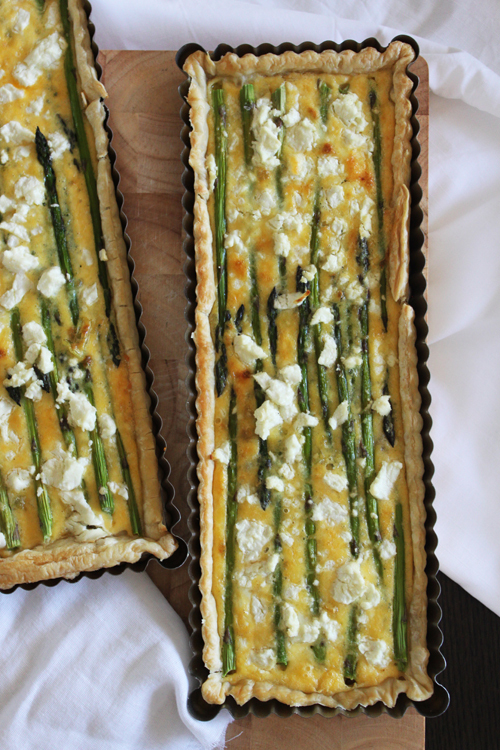 Place the asparagus evenly on the tart, spear tips pointing to the centre and the thick ends at the edge of the tart, and then carefully fill the tart with the egg mixture. Crumble the goats cheese over the top, and bake in the oven for 30 minutes or until set and golden. This is absolutely the kind of tart I love a lot. 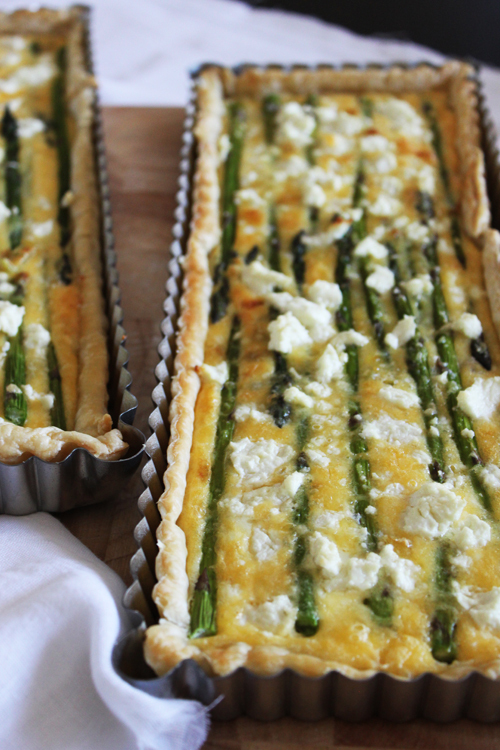 I am a big fan of goat cheese and asparagus. Your tart looks delicious. Hi Natashia, I just came across your blog, and really like it. This tart looks delicious, and I love your photos! 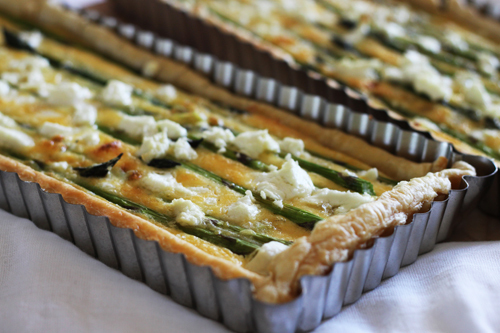 I will try making it next spring when asparagus is in season in California. Ah! Gorgeous photos, delicious results! Hilarious story!!! I hope the elderly lady realized how you had to suffer for her impatience and apologized - but somehow I doubt it! If I weren't going Halloween costume shopping I would run over to the farmers market right now and make this!! looks delicious!! Great blog- following you! The old lady did apologise, she was sweet... then she disappeared leaving me in a puddle of cream!